RegTech, Payments, Modular Banking, InsurTech, Cloud Communications & Biometrics. Solgari, the global provider of compliant, omni-channel cloud communications services in conjunction with Enterprise Ireland , Ireland’s national investment and export agency and one of the world’s leading FinTech investors, will be exhibiting at Hong Kong FinTech Week , the world’s first cross border FinTech event from October 30th to November 1st at the Hong Kong & Exhibition Centre. Hong Kong FinTech Week is the world’s first cross-border financial technology event, taking place in Hong Kong, Asia’s financial capital, and in Shenzhen, China’s Silicon Valley. It’s one of the largest conferences on the calendar, attracting more than 8000 senior executives and featuring over 200 of the world’s top FinTech founders, investors, regulators, and academics, who are shaping the future of financial services by driving a technological revolution in the industry across Asia and globally. Power all customers communications – voice, video, chat & SMS – on a single cloud solution for all global offices. Achieve instant digital transformation by offering clients all the modern communication channels. Financial Services compliant recording & archiving of all communication channels as required. A single data view and analytics across all customer interactions. Integration with core it such as Microsoft Dynamics 365. At least 50% cost savings with a per user per month SaaS model. Our Asia Pacific customers include Private Equity, FinTech and Insurance firms in Singapore, Hong Kong & Australia. At Hong Kong FinTech Week , we are meeting existing partners including Microsoft and Principle One and exploring new partner and customer opportunities across the Hong Kong FinTech, Hedge Fund and Insurance industries. Please free to visit us at Enterprise Ireland booth 3F during event or schedule a meeting in Hong Kong from October 29th. You can see more about the event at Hong Kong FinTech Week. As one of the world’s leading technology hubs, Ireland is a hotbed of fintech innovation, helping the financial services industry respond to challenges from the digitisation of banking to new payments models and ever-changing compliance requirements. Enterprise Ireland is Ireland’s national investment and export agency which invests in start-ups and develops them internationally through its network of over 30 offices worldwide. Enterprise Ireland works with over 5,000 companies across all sectors helping deliver leading edge products and services globally. 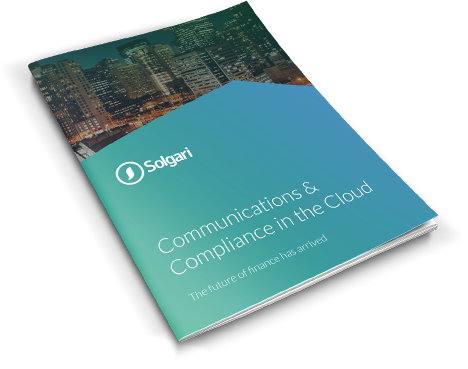 Solgari provides Compliant & Integrated Omni-Channel Cloud Communication Services to FinTech, Financial Services & eCommerce customers in 40 countries to date. Our integrated cloud software service provides all the digital business communication channels – voice, video, chat, IM & SMS – while also including GDPR, PCI DSS & MiFID II compliant recording & archiving of all communications.